Can't sleep.. can go riding! With the PNR team! Due to my work and family schedule, I cannot regularly do the LCSG but still wanted to cycle. 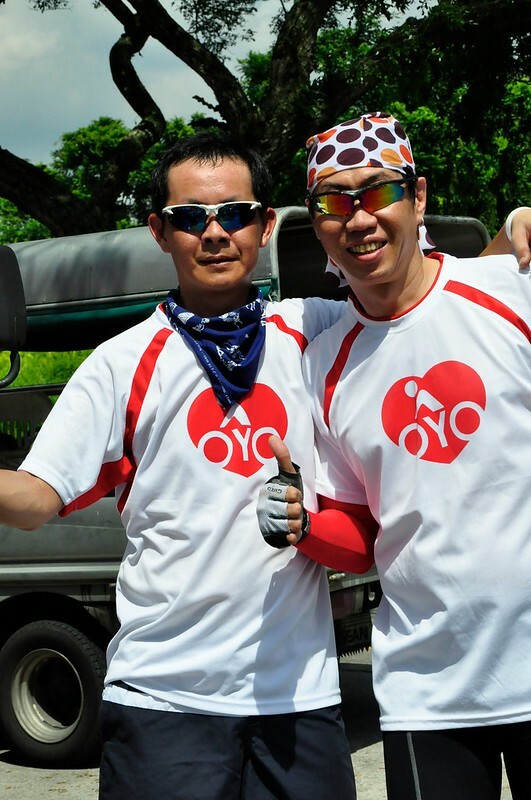 … So I sent out a simple post on Love Cycling Singapore (LCSG) Facebook (9th March 2012) checking for cyclists of the same interest staying around Punggol area and it developed into a regular night cycling event. Cyclists of common interest in this estate came together and rode together. This group grew immediately within two weeks. It has become a regular group of riders of counting more than twenty cyclists setting off regularly from Punggol Popeye fast food restaurant. To manage this better, create da dedicated facebook page to track the events and postings for this group of riders. The facebook became a common platform to shared biking knowledge and news within the group. 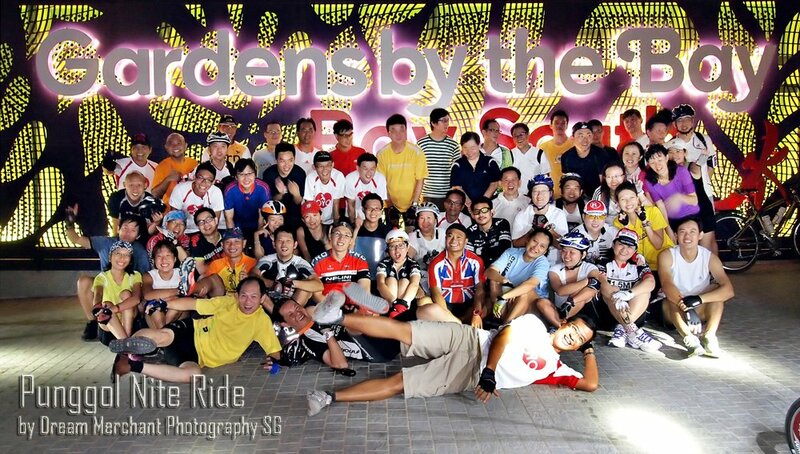 One of the cyclists, Melvin Chua named this group “Punggol Night Rider” on 16th March 2012 naturally. This group of riders consists of folks from all areas of life in Singapore, guys, gals, fathers, mothers and etc. Many are fathers who will settle their kids and family in the early night before coming out for a joyful night ride. Many also joined the group knowing that it is scheduled on Friday night for a good healthy workout and winding off after a week of hard day work. Rides are scheduled regularly on Friday nights at 2230hrs. I want to comment my buddy... Christopher Lee, a kind and thoughtful photographer who often brought along his camera and captured countless beautiful group photos for the PNRs before, during and after each ride. For almost every night ride, a recce will be done before the ride is conducted. A group of dedicated regular riders contributed selflessly and mindfully into planning each route and surveying each and every detail on the PCNs and roads before each Friday night ride is executed. As the group is huge, composing of experience, amateur and non-confident riders, we will normally split the assembly up into smaller groups with safety riders to safe guide and watch over the group along the way. I often will be at the sweeping end overseeing the whole ride, making sure that everybody in the journey is safe. All this rides can only happen because of a a team of dedicated volunteers, namely Hardy, Kevin Fong, Eric Ng, Christopher Lee, Calvin Siow, Rick Wong, Grace Chew (Dean’s Wife), Desmond Teo, Lee Oon Teng, William Tan, Alvin Lim, Stanley Lim, Jeffery Ong, Thomas Heng, Gray Boo, Freddie Soh, Ronald Wong, Edmund Wong, Melvin Chua, Wan Tiger, Khairul Rahim, Sean Charlton Xavier, and many more to join, has come together to assist me in any way possible to make each ride joyful and successful. It has become a very well protected and guided ride with safety riders alerting one another of the ride situation on their walkie-talkies. Many new riders felt safe riding with the group and join the ride regularly. Friendships were built up after each ride and the group grows stronger each week. Motto of PNR : RIDE SAFE AND HOME SAFE. Till we meet again next Friday at Punggol Popeye 2230hr. Join us when you are free, no strings attached. :D See you soon. Cheers. No Space for bike lane? Improve the aesthetics of the traffic light ????? Surly Dummy, My Family Limo! Safe cycling... this is not.